Mankind's age-old battle with the Sun was advanced in 1755 when Scottish professor William Cullen created the first artificial refrigeration box. Before Cullen's innovation, sourcing, transporting and storing ice was a very important social function and humans devised many ingenious thermal environments to keep food, drink and medicine fresh. To store ice successfully through the summer months, stonemasons around the world designed magnificent stone icehouses or ice houses to keep the cold in and the heat out. This is the story of a very special Scottish icehouse which has been altered to reverse the forces of nature, to keep all the warmth on the inside. 3500 years before Professor Cullen’s magic cooling box, a cuneiform tablet dated to 1780 BC recorded the King of Mari instructing the building of a "stone ice house" in the northern Mesopotamian town of Terqa by Zimri-Lim. By 400 BCE in Iran, to assure rulers were served the freshest possible foods, Persian engineers had mastered techniques of storing ice in the middle of summer in the seething hot deserts. Ice was cut in nearby mountains in the winter and stored it in specially designed, naturally cooled proto-refrigerators called yakhchāl (meaning ice storage). These large underground spaces were up to 5000 m³ (180,000 cu ft) in volume with 2 meter thick walls constructed of an effective water resistant mortar called sarooj , composed of clay, egg whites, sand lime, goat hair and ash, which resisted heat transfer and was claimed to be completely water impenetrable. A yakhchal draws cold air in at the base of the structure and it descends to the lowest part. The tall conical shape guides warm air upward and out through openings at top, assuring the air inside remained cooler than on the outside. Then around 300 BCE Alexander the Great commanded the creation of "snow-pits to hold ice" and in the third century AD in Rome, snow was cut in the mountains, stored in straw pits and sold from "snow shops." Merchants and retailers haggled on ice prices, as compressed ice formed deep in the pits sold at a higher price than the less compact ice on top. At this time, the ice industry was born. In Britain, medieval ice pits have not survived but the first stone ice houses appeared in the 17th century when James I of England commissioned the construction of the "first modern ice house (or snow conserve)" in Greenwich Park in 1619. King James later commissioned a second ice house at Hampton Court in 1625, which was a brick-lined round well, 30 ft (9.1 m) deep and 16 ft (4.8m) wide and covered with a "thatched timber building." The grandson of James 1, Charles II, was famed for promoting science and technology, thus, he commissioned an ice house in Upper St James’s Park (now Green Park) in London in 1660 as both a "scientific experiment and a social device" to impress his guests by providing them with chilled drinks in the height of summer. 17th century British ice houses were mostly brick lined, domed structures, cylindrical shape with the bulk of their volume underground - engineered for temperature regulation and strength. Most, but nor all, were rounded at the bottom to hold melted ice and they all had under floor drains. Ice houses, since ancient days, were used to keep fish fresh, when caught in distant waters. In 16th/17th century England low-lying areas in the Thames Estuary were flooded during the winter and cut ice was stored in insulated wooden houses along the river which was used to supply the main ice houses, most often located on the estates of large country houses. This system of storage was allegedly copied by “an Englishman who had seen ice storage techniques in China.” As early as 1823, records show vast tongues of ice being imported into England from Norway. John Buonarotti Papworth’s 1818 Design for an Ice House. A typical commercial British ice house was around a 9 x 30 meters (30 x 100ft) and 14 metres (45 ft) high storing around 2,700 tonnes (3,000 short tons).The designs of British ice houses varied from place to place, some being buried in deep underground chambers and other nestled into hillsides for insulation, but they were all situated close to natural sources of winter ice such as freshwater lakes, ponds and streams prone to freezing. During the winter, ice was cut from lakes and rivers and transported by horse and cart to the local icehouse where it was wrapped in straw and sawdust for insulation and stored to be used as a source of ice during the warm summer months. By the mid 19th Century, Londoners wanted ice for food preservation, for making ice cream, and for medical use but the British climate couldn't sustain the cities demand for ice. And while it was gathered from lakes and from the Regent's Canal, the amount of ice available was nowhere near enough and its quality was poor and inconsistant. Ice started to be imported from the United States in the 1840's from the Wenham Lake Ice Company and Carlo Gatti brought his first consignment of ice from Norway to London in 1857, of 400 tons, and one of the two ice wells at 12-13 New Wharf Road was created to store it. In the last 40 years of the century Norwegian ice dominated the market in London until the end of the 19th Century when ice machines began to compete with the naturally harvested product. Albeit London was the biggest consumer of ice, many of the products shipped to London were from the remote Highland of Scotland and needed to be chilled, bringing us to The UK's best preserved and most spectacular ice house, located in Scrabster, in the county of Caithness on the north east coast of Scotland. 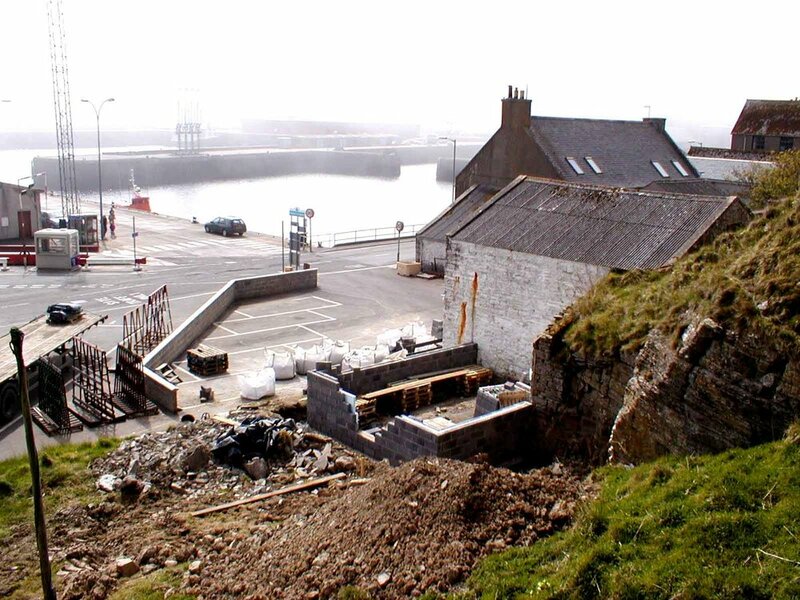 The Scrabster ice house was rubble-built and gabled to the front with two windows, one facing the harbour and the other situated high up on the back wall facing the slope of the Braes of Scrabster, in to which the Scrabster ice house in nestled. Built in the early 19th century this Category C Listed Building was a dilapidated ruin until 1999 when local fish-salesman Jim Cowie and his wife Mary, whose passion, dream and vision saw the beginning of a massive salvage project - the sympathetic renovation of the old Scrabster Ice House and Salmon Bothy. For over two years Jim put together teams of specialist stonemasons and replaced every single roof tile, lifted the heavy Caithness slate floor, repaired the drain, pointed stones and most importantly, they extracted hundreds of litres of moisture and salt crystals from the interior stone walls. And as if that wasn't enough, they entirely restored the adjacent fisherman's cottage, not to mention building a modern kitchen onto the ice house. The following images are from the restoration project. Today, the ice house is called Captain's Galley, one of the world's highest awarded Seafood Restaurants and a leader in sustainability, traceability and seasonality. The restaurant is highly-respected in culinary circles for its "genuinely" compassionate and "meaningful" ethical food sourcing policies. So far in 2017 the restaurant has been awarded; Sustainable Restaurant of the Year and a Sustainable Gold Medal at the Scottish Food Awards and hold Triple Pundit (sustainable bloggers) #6 in the World's Top 10 Sustainable Restaurants. It also grabbed the "Sustainable Restaurant of the Year" award at The Scottish Food Awards, and a Gold Award at the Green Tourism Awards, not to mention a Trip Advisor certificate of Excellence. The secret to the Captain's Galley's international success lies not in the words of its highly accredited food sourcing policy, and not because it hold membership with several sustainable organisations. The secret, is that the owners, Jim and Mary, synchronise themselves and their business with the cycles of nature. With seasonality at the forefront of their food philosophy, the tastes and nutritional value that comes out of their kitchen is in a league of its own and from the saturated colours to the unexpected textures, the subtle scents to the surprising tastes, this is a sample of what they serve. The restaurant's produce is all indigenous to the local area and sourced within a 50 mile radius of Scrabster. This self imposed geographic restriction forces Jim to look for wild foods in Caithness, and this requires knowing exactly what fish, shellfish, plants, vegetables and fruits do, in different seasons. Jim's daily jaunts to Scrabster fish market ensure the catch of the day is of the very best quality, from non pressure stock species, caught by the most sustainably minded fishermen. And these aren't the fishermen of yesterday that aimed to fill their boats to the gunnels, often sacrificing the quality and freshness of their catch, with little concern of the future of stocks. The Boy Andrew fishing company from Wick, for example, have just invested in a state of the art fishing boat - Boy Andrew WK170 - capable of weighing fish at sea and micro-controlling the temperature of the fish-room, they offer consumers some of the best quality, cared for, fish in the world. And as you can see, these northern hunter gatherers risk their lives daily, to fill our bellies. A key element in Jim's success as a chef lies in his life-long relationship with these fisherman and his ship to shore network gives him real-time knowledge of weather cycles and fish stock movements, therefore, what to expect on the fish market. Turning a 19th century icehouse into a world leading SEAFOOD restaurant. Hold on one second! I'm a historian, so why on earth am I writing about boats and fish restaurants? Well the answer is because Jim and Mary are my mum and dad! Over the last 15 years I‘ve helped them with various aspects of the business from painting the walls and serving tables to marketing it. I can say confidently that the inner secret of their success is found in their personal life philosophies: simplicity, integrity, sustainability, seasonality and traceability. So many hospitality businesses use these terms, but in reality, most chefs ethics stop when kitchen the lights go out at the end of a shift. My mum and dad on the other hand, grow their own veg and herbs in their Garden and poly tunnel. They spend their spare time, not ordering from suppliers in the south, but cruising round Caithness and Sutherland sourcing natural plants, herbs, fungi and soft fruits from glens and woods and it is not uncommon to wake up at my folks house on a Sunday morning with my father returning home with bags of specific seaweeds, from local beaches. While reviewers concentrate greatly food, to me however, exactly 50% of my parents business success can be attributed to the food, while the other half rests in my mums bedazzling creativity. At night, with candles sparkling in the ice house and soft Scottish tunes on, sitting in this hyper-ambient historic environment compels me to visualise the ancient builders climbing around the stone shell of the ice house on wobbly wooden scaffolding. She has this way of enhancing the historic environment with the careful use of light and shadow, which takes guests back in time, and even diners with little imagination can almost see the teams of hardy stonemasons cutting, shaping, polishing and heaving massive stones, some as heavy as 8 tonnes, with thick grass-ropes, risking their lives to create this most magnificent building. Back in the year 2000, I recall standing in the ruined ice house with my folks and my brother, questioning what on earth my family had done. Water was running over the floors and dripping from the ceiling. My dad was a fish salesman and my mother a nurse, and they now had a ruined 18th century building to deal with. What is more, 3000 years of men have developed this type of building to keep warm air out, how on earth would they even begin to reverse this process and make the building suitable for entertaining diners? Over the following two years teams of historians and building specialists visited the ice house and each added colour to what was at that time was a grey lifeless building, screaming for a lot of TLC. Specialists told us the primary reason the Scrabster ice house is heralded as the "finest in Scotland" lies in its incredible barrel vaulted ceiling with a gabled slate roof. Its careful design and practical ice holding functions aside, sitting beneath this ceiling, one might as well be dining in the grand banquet hall of a 13th century castle. The purpose of the unusual upper window entrapped our attention for several months but everybody we asked offered a different answer as to its original usage, but its function was revealed upon studying the landscapes surrounding the ice house. Researching a 19th century Ordnance Survey map of Scrabster, a straight black line was found running from the position of the small window in the ice house to the old hill road at the top of the Braes of Scrabster. The line was of course an ice chute! Ice was cut from the ponds on Holburn Head on the Braes of Scrabster and from low lying areas in the surrounding fields. Cartfuls of ice would have been delivered to the top of the Braes an slid down the chute, into the small window in the ice house, where they were then wrapped in straw and added to the stock. It's truly incredible to think that Alexander the Great's men wrapped ice in straw and the same tradition was still being used in 18th century Caithness. After owning this building for 15 years you would imagine our family know every stone and story associated with this building. But this is not the case as a particular feature continues to baffle every specialist that attempts to solve the mystery. My mum currently sets up the old fisherman's cottage as a pre-dinner drinks bothy, but only a couple of centuries ago this was a single-storey 3-bay fisherman's cottage and you can almost see the sea-hardened men repairing their fishing nets in the corner, and throwing salmon and huge blocks of ice back and fore. During the restoration project, when the plaster walls were removed, in the north east corner of the cottage an enormous lintel has been set horizontally concealing behind it, a 2 x 2 meter hidden room. This secret space has what appears to be a large chimney, which was created by a method that uses the architectural technique of corbeling, to span a space or void in a structure. This method is found in the ancient burial cairns peppered across the surrounding Neolithic landscapes dated to 3500 BC. Most people first assumption is that this secret area may have been designed for smoking salmon, however, archeologists pointed out that after close inspection "not a single" trace of smoke, soot or fire damage was identified on the stones. It was 'never' used as a chimney. So, what was this curious space designed for? The most compelling suggestion, to me as a historian, associates the salmon bothy with John Gow - the legendary Orkney Pirate. Born around 1698, in the nearby town of Wick, Gow become a notorious seaborne villain based between Caithness and Orkney. Could this secret room, at one time, have been a pirates smuggling hole for the storage and quick removal of contraband? Sitting in the Bothy, it's easy to picture a gang of pirates shuffling wooden chests up the hidden hole to evade approaching customs officers. If any readers know what this unique feature actually is, and the answer is that it is "not" a pirates smuggling hole, then please keep your ideas to yourself as cherish the thought that my mum and dad work in a building that at one time served as a pirates lair designed for smuggling loot between Caithness and Orkney. The real highlight of the Captain’s Galley, food and service aside, is the womb-like comfort you feel in the grasp of this truly unique historic environment. My mum and dad are very friendly down to earth folk and look forward to welcoming you at Captain's Galley. And as you will see when you meet my folks, their dreams, and those of the men who built the Scrabster ice house, are very much alive and kicking in the coolest ice house in the world.